Dunkin’ Donuts today is launching TV spots called #MyDunkin, featuring the brand’s passionate Twitter fans. It’s the latest social media-minded initiative led by global CMO John Costello, who was behind the industry’s first TV commercial made entirely from a Vine video. The marketing exec is pretty excited about mobile, too. You recently made advertising history with Vine spots. How did you get to this intersection of social and TV? We’re finding there’s real synergy among social media, mobile and traditional marketing. While each one works independently, the real power is integrating all of those things. They are generating incredible buzz and consumer engagement. It also brings to life our partnership with Monday Night Football. With Vine, it’s hard to quantify business results. But we know that as consumer engagement increases for Dunkin’, the business increases. Are we going to see more social video on TV from Dunkin’? Absolutely. We are very pleased with the Vine effort and are very interested in what social video can do for us. But there’s skepticism about how well social and TV actually work together. There will always be skeptics on innovative new techniques. Customer testimonials have been an effective form of advertising for decades, and social media simply makes it easier for consumers to share their thoughts and advertisers to capture them. You touched upon mobile and traditional. Where else are you testing the combination? Tying into our larger Philadelphia Eagles promotion, we’ve offered a free cup of coffee in that market if you download the mobile app and if the [NFL team] wins. This kind of interaction among all of the screens led to developing #MyDunkin. It leverages the passion consumers have for the brand. We’ve found in the last few years that letting consumers talk about Dunkin’ is far more powerful than any brand message we could put out. You have 3.5 million mobile app users. Do you envision more interplay between the app and the in-store experience? Yes. 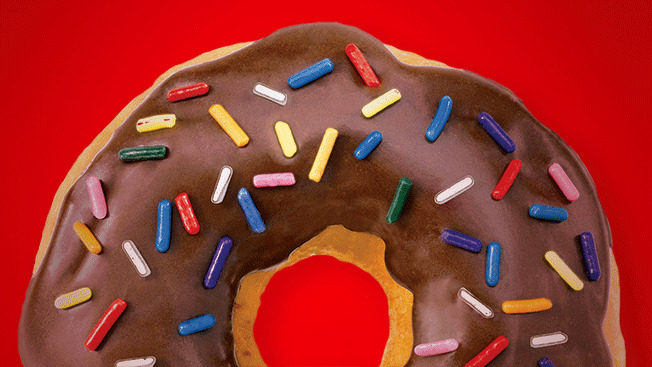 You can use the mobile app to find a local Dunkin’ and receive geo-targeted offers. The mobile offers change as you go from market to market while using push notifications for location-based targeting. Are you zeroing in on Gen Y? In many ways, we’re the perfect brand for millennials because they want to eat and drink what they want, when they want it, where they want to eat it. And all of our menu items are available all day long. Social media is going to be an important way we connect with them. Millennials love Snapchat. Is Dunkin’ using it? No. But we’re very interested in testing innovative ideas. Look at our relationship with [mobile-social maps app] Waze. We’re intrigued with the social components of Waze where people tweet about local street traffic and Dunkin’ Donuts espresso. CPGs talk about Big Data more than retailers. Do you rely on data? We have real rigor in terms of analytics. But I think Big Data should supplement your judgment more than replace it. Sometimes companies can get caught into analysis paralysis. Speaking of Big Data, what was the process like to find fans for the #MyDunkin spots? That had to be fun. Our team at Hill Holliday went through literally thousands of tweets.